Following Tuesday's elections, women, people of color and the LGBTQ+ community across America have something to be proud: More than ever before, we are seeing our own faces looking back at us from Congress. 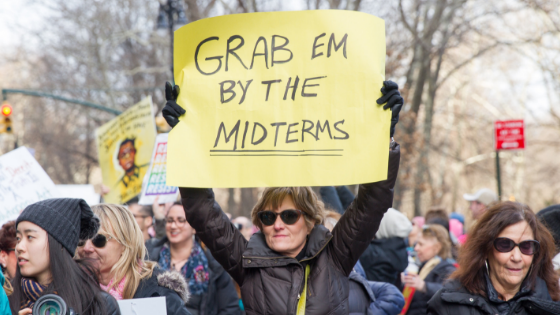 Previous to 2019 midterm elections, women have never occupied more than 84 of the 435 seats in the House of Representatives. With some races still up in the air after Tuesday, as of now, 98 women (both Republicans and Democrats) won their elections to hold House seats after the Tuesday elections, with votes still being counted. Those 98 House representatives are joined by the 13 women who won Senate seats, and the 10 female Senators who were not up for re-election. That means that, altogether, Congress will employ at least 121 women in January 2019, including a record number of non-incumbent women. This is a drastic improvement: 107 women were members of Congress before Tuesday, representing 20 percent of Congresspeople. Now, women make up 23 percent—an upward tick, sure, but there is definitely room for continued growth. But, beyond seeing the number of women in Congress rise, there are other gems to be found in Tuesday’s election: people of color and the LGBTQ+ community were also championed in historic victories, marking many firsts. According to the Rutgers University Center for American Women and Politics, January 2019 will see a record number of women of color. That same 121 women is comprised of the first Native American women, the first Muslim women and the youngest woman in American Congressional history. In Michigan and Minnesota, respectively, Democrat Rashida Tlaib and Ilhan Omar of the Minnesota Democratic-Farmer-Labor Party are slated to be Muslim women in Congress. Omar, who fled to the United States over 20 years ago as a refugee, is also the first Somali-American member of Congress in the United States. Sharice Davids and Deb Haaland, both Native American women, won their House races in Kansas and New Mexico, respectively—Davids also identifies as a lesbian, making her Kansas’ first openly LGBTQ+ member of Congress as well. Colorado also elected its first openly gay governor, with Democrat Rep. Jared Polis winning his gubernatorial bid against Republican Walker Stapleton. Oregon’s Democratic Governor Kate Brown, who identifies as bisexual, was re-elected this election as well--Brown became the first openly LGBTQ+ person to be elected governor when she replaced John Kitzhaber in 2015. Tennessee also elected its first female Senator, Marsha Blackburn, who defeated Gov. Phil Breseden by roughly 10 points. No matter who wins in Arizona (at the time of writing, no winner has been announced), the state’s senator will be female. In the very tight race, GOP Rep. Martha McSally is running against Democratic Rep. Kyrsten Sinema, as both vie for the spot vacated by Senator Jeff Flake. In Texas, voters propelled two Hispanic women to Congress for the first time ever—Veronica Escobar won in the Congressional district near El Paso, and Sylvia Garcia was elected in a district near Houston. In South Dakota, Republican Kristi Noem became the state’s first female Governor, beating out Democrat Billie Sutton. Until her election on Tuesday, Noem was serving as South Dakota's at-large member of Congress. In Massachusetts, Ayanna Pressley became the first black woman elected to Congress in that state. In the September primaries, she defeated Michael Capuano, the 10-term, staunchly liberal incumbent who had served for 20 years. Her tearful, reaction to learning she won over Capuano went viral on Twitter. At 29, Alexandra Ocasio-Cortez became the youngest woman ever elected to Congress, surpassing Republican Rep. Elise Stefanik, another New Yorker who was elected to Congress at age 30. Just after her election, she revealed that she cannot yet afford an apartment in Washington, D.C, and told several news outlets that she was bartending and working several jobs prior to her election and throughout her canvassing for election. Her campaign and victory inspired young people across New York City and beyond. In Georgia, there is still controversy and at the time of writing, no winner in the race between Brian Kemp and Stacey Abrams, though Kemp claimed victory. Legal questions are muddled and the legitimacy of Kemp’s claims is being questioned, giving Abrams and her celebrity supporters--including T.I., Kelly Rowland and Oprah Winfrey--hope for Abrams’ victory. It’s important to note, though, that hope cannot only be found among those who won. Voter turnout was higher than expected—a huge accomplishment following a presidential election with infamously low turnout. More women than ever before ran for Congress. Vermont’s Democratic nominee, Christine Hallquist, made history as the first transgender major party nominee for governor, and Florida very nearly elected the state’s first black governor in Tallahassee Democratic Mayor Andrew Gillum (though there is still hope, depending on whether or not a recount happens). Texas Democratic nominee Beto O’Rourke garnered country-wide adoration and support, with celebrities like Beyonce and Sara Bareilles throwing their support behind him. In fact, Josh Gad, Alyssa Milano, Busy Phillips, and Olivia Wilde are already looking to 2020, tweeting support for a Beto O’Rourke/Andrew Gillum presidential ticket. But, regardless of party alignment, men and women across the country are cheering at the election of a previously unseen Congress—more diverse than ever before, and more representative of the diverse country it represents. For the first time, every American—no matter who they are and what their identity politics are—had someone to look up to and be inspired by in this election. And that, most can agree, is something to be proud of.